In an interview with CNN's Wolf Blitzer, Bill Gates, Microsoft founder says that he hopes President-elect Obama and his newly formed Congress approve a wide-ranging stimulus package. He believes that this can jump-start the nation's economy. He also believes that Obama can double the United States' commitment to foreign aid, along with increasing investments in the national education system and better technological ventures. This could be one of the main steps to stare of recession. 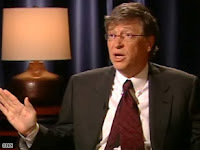 He believes that we need to at least double the United States' annual investment in foreign aid to $50 billion by 2012. Gates seriously believes that Barack Obama will live up to these commitments. The stimulus package is needed to further promote jobs. With just 47 days until his inauguration, President-Elect Obama wants to start his first term with a running start having put together his cabinet well before his first day in office. In the mean time, he patiently waits for his turn in the Oval Office.